LGBT+ individuals constitute the most vulnerable population segment segment in Central America, especially when their sexual and gender identities intersect with working class backgrounds, indigenous or afro-descendant lineage, and other marginalized identities that still suffer badly in a region rife with political and criminal violence, and gross social inequalities. Fundación Igualitxs strives to change their stories and build a society that is more just, equitable, and democratic, a region that fully respects human dignity and extends opportunity to those hitherto left outside traditional interest groups. Fundación Igualitxs has had significant impact in the struggle for LGBT+ rights in Costa Rica, and to a lesser extent in El Salvador, leveraging its limited resources and the ingenuity of its members across a three-planked axis: academia, strategic litigation, and campaigning. The next step is to establish working offices that develop our projects in Central America. Tackling discriminatory laws is of the highest priority, overturning bans on blood donation, military service, discrimination in healthcare, and access to marriage. Campaigns focus on storytelling efforts to demystify the lives of LGBT+ individuals and win hearts and minds to meet the populist Evangelical ideologues seeking to poison perceptions and prospects of an already precarious community. 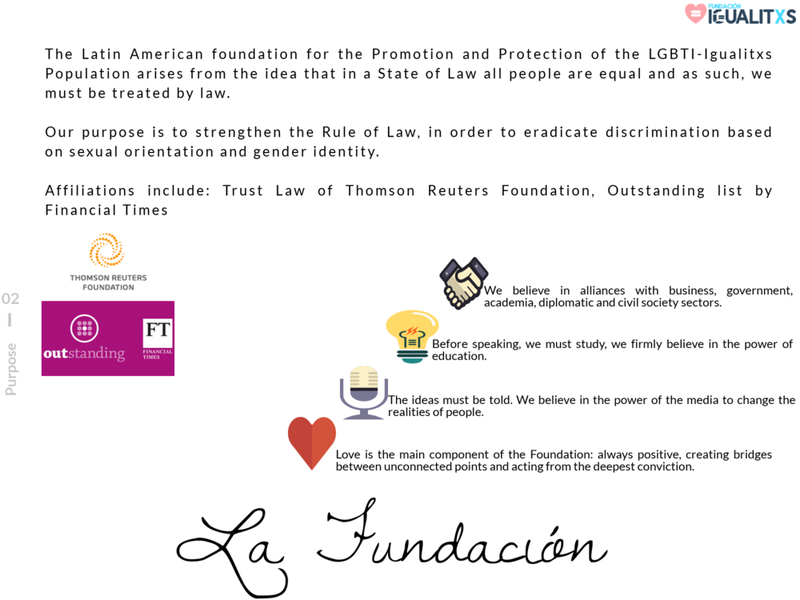 Fundación Igualitos is the leading Think Tank, strategic litigation and campaigning center forLGBT rights in Central America.